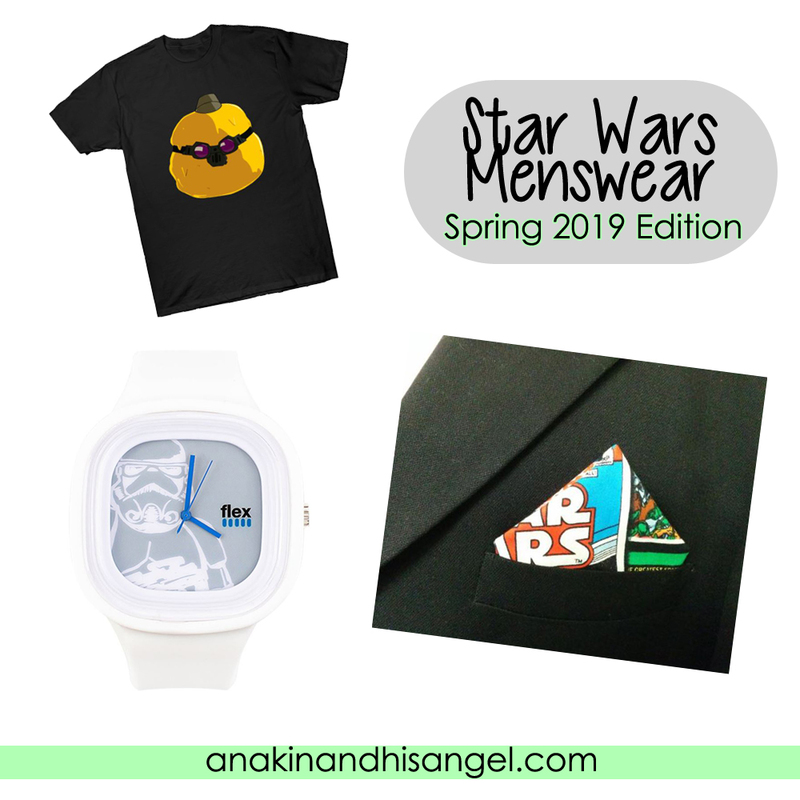 Spring is in the air which means it's time for another roundup of Star Wars fashion picks for my fanboys! If you're new here this a series I started last year where I feature my favorite Star Wars wear for each season as a means to help you update your wardrobe or simply inspire your fashion choices. Below you'll find some shirts and accessories to help you transition into the warmer days. 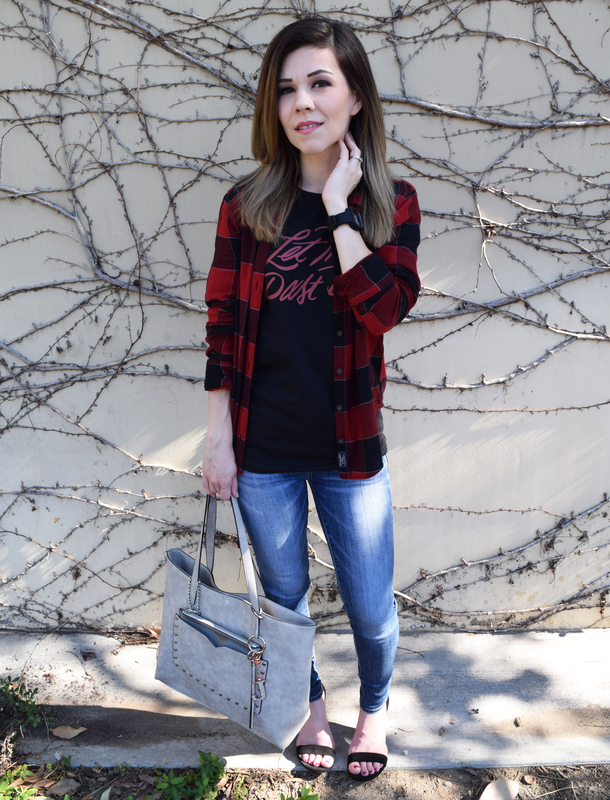 Oh, and ladies if you missed it I featured my Spring picks for you in this post. Plus there's no rule saying you can't wear what you see here! Fans of Star Wars Resistance know that merchandise featuring our favorite characters from the show are few. When I discovered ZenKenobi on Twitter I instantly fell in love with his adorable designs! All profits from his t-shirts go to Mare, an organization that helps find loving homes for kids in Foster Care. This shirt is available in sizes XS-5XL and comes in different styles from a Classic t-shirt to an extra soft Triblend t-shirt. If you're not a fan of Opeepit check out the Bucket and CB-23 designs! If you're the kind of person who likes to wear your Star Wars fashion in a subtle way, this Stormtrooper watch would be a great option. Flex makes the most comfortable watches I have ever worn! Some of the key features that make these watches stand out are their interchangeable bands and the fact that they are water resistant. Plus, each purchase gives 10% back to a specific charity depending on the color of the band. With this particular style you'l be supporting the United States Veterans. You can get $10 off this watch with the code "Ambassador35" and my referral link. You're going to need something to carry your essentials in for those long walks and sports games! I think this is a decent sized sling backpack especially for those of you who don't tend to carry too much with them. There are several compartments to help with organization and an adjustable strap to get the perfect fit. This might even be something to consider to bring for the opening of Galaxy's Edge! This Max Rebo Band t-shirt is an exclusive to BoxLunch and is currently on sale (normally $28.90). There are a lot of great characters who usually don't get too much love featured on this shirt. I also find it humorous that Boba Fett is included in this group. What instrument do you think he would he play? You can currently find this shirt available in sizes XS-XL. Spring also means Wedding season is upon us. So if you've got one coming up and you're wearing a tux, this Etsy shop has got you covered! The right amount of "geeky" can be found in this 9x9" classic Star Wars pocket square. It's made of 100% cotton and can be folded to your liking. Hats are one of those accessories you can wear year-round. I spotted this new one of BB-8 giving his iconic "thumbs up" in The Force Awakens and thought it was too cool not to share. This hat has and adjustable strap so you can get the perfect fit. Happy Beeps! Tell me, which of these is your favorite? Let me know in a comment below or get in touch with me on Twitter. Stay tuned for the next round-up this Summer! The panel that so many Star Wars fans have been looking forward to didn't disappoint. 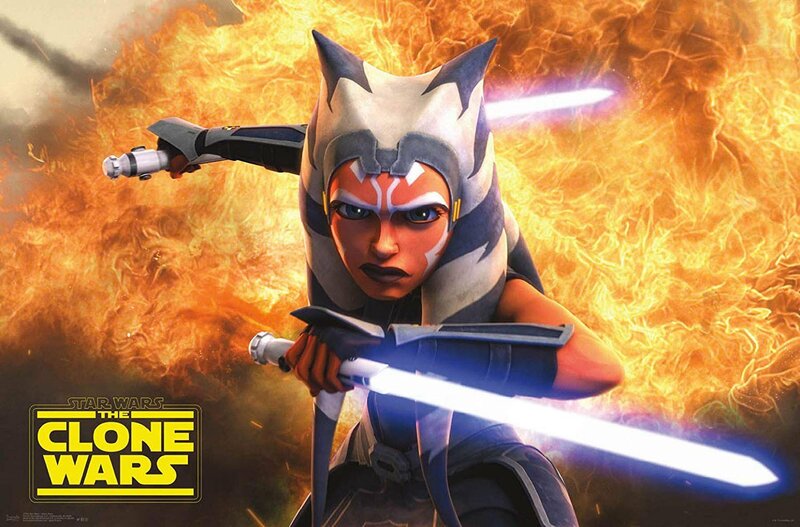 That's right, I'm talking about The Clone Wars: Sneak Peak panel at Star Wars Celebration! Dave Filoni (Writer and Director of The Clone Wars) revealed three clips from the upcoming show, exciting news and a trailer! So before I share with you the photos that were shared and some information about Season 7 that really stood out to me, I think you might want to take a look at the trailer. Watch it below! In my opinion the trailer was beautifully edited and it made me feel exactly like I used to when the series was still running. I never thought that the story would be be continued so being able to watch a few minutes of what will eventually be twelve episodes really was so fulfilling. 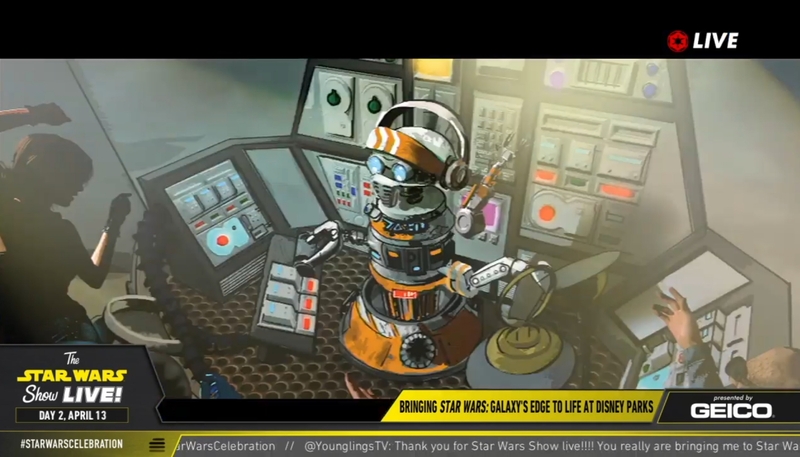 Dave Filoni and Dee Bradley Baker (Captain Rex & Clones) also shared with the host of the panel, Warwick Davis, that they didn't think this would ever happen. Dave said he was pushed to finished The Clone Wars by Carrie Beck (Vice President of Animation and Live-action Development at Lucasfilm). The transcript above were text messages between Ashley Eckstein (Ahsoka Tano) and Dee Bradly Baker. Ashley explained this was how she found out that the show was coming back! Dave sat back with his hand over his eyes in disbelief over their sillyness of their conversation and lack of being able to keep secrets. Dee Bradley Baker simply responded with, "Rex had to tell Ahsoka!". Dave ended the discussion by explaining their mischievousness is why they are only doing twelve episodes. Because the actors can't handle the secrets. HILARIOUS! This was one of Dave's answers to Warwick asking about what we can expect to see in the show. I think it will be amazing to see these guys in action! In fact, we got to see a scene with them in one of the clips fighting against some Battle Droids. Dave also said that there will subtle differences in character faces so that they can be better animated and emotions can ring a little truer. There were photos of comparisons given between the previous episodes and the upcoming episodes (seen above) and I don't see too much of a difference which I'm happy about. We were introduced two new characters in the show, Trace and Rafa. They are twin sisters from the Underworld 1313 on Coruscant. They will eventually meet up with Ahsoka Tano. I think their hairstyles are real fun and edgy and their outfits are super wearable. I have a feeling we'll be able to buy these pieces somewhere like Her Universe or Musterbrand at some point. Wouldn't you agree? Of course, Bo Katan is also back and according to Dave Filoni she plays a big part in the Seige of Mandalore. I love the new cloak she wears, especially the way it looks worn with her helmet. It's quite mysterious! I think the cosplayers out there are going to have a lot of fun with this! Sam was very enthusiastic about his role as Darth Maul in the upcoming season. He had to keep the secret of the show returning for a year and he said it was the absolute worst secret he has ever had to keep. He also shared that Darth Maul tries something different than what he normally does in his obsessive quests for vengeance. I honestly am so stoked to discover what he is talking about! Oh, and can I just say that I think it's so amazing that Maul's new outfit was inspired by his look in Solo: A Star Wars Story!? What do you think? This was one of my absolute favorite moments of the panel! I am so happy that Ray Park got to become the character of Darth Maul again and use his skills as a martial artist to help Dave Filoni create an epic lightsaber duel between Darth Maul and Ahsoka Tano. Sam Witwer said that he got to be there the day they were recording and that he absolutely loved it. We got to see one of the new outfits, which happens to be a super cool jumpsuit, that Ahsoka Tano wears in the series. Dave talked about how Ahsoka Tano might have worn something a bit simpler having left the Jedi Order but was sure that Ashley would want to make it. Right after one of the clips, which showed Ashoka on a speeder bike, Ashley said that she wanted to make it. So, I think it's safe to say that we can look forward to being able to purchase this piece from Her Universe at some point! Ashley Eckstein also talked about how it took her a while to go back to the younger version of Ashoka and really get into that head space she was at in that point in her life. She explained that we would see a lot of character development with her character in these episodes. The third clip that was shown was probably the most emotional one because it involved Anakin Skywalker, Ahsoka Tano and Captain Rex. It seemed that Ahsoka had just returned in this scene. Anakin leads her to Captain Rex where she is met with many of her Clone friends who now have her markings on their helmets. *Sobs* I don't want to give too much away as I really think it's worth watching. You can see it here (4:23:50). The show concluded with surprise guests including Matt Lanter (Anakin Skywalker), Catherine Taber (Padme Amidala), James Arnold Taylor (Obi-Wan), Tom Kane (Yoda) and Matthew Wood (General Grievous). They thanked the fans for their support throughtout the years and talked about how they're very much a family. Finally, Dave Filoni said that The Clone Wars works so well because he listened intently while he worked with George Lucas. This made me tear up. We would have none of this if it weren't for George Lucas and his fascinating imagination! There was no date given for Season 7 but it will be coming to Disney+ soon! To watch the entire panel, you can find it on the live stream by clicking here (3:43:10). The Mandalorian panel was a huge highlight at Star Wars Celebration. A teaser trailer, behind the scenes footage as well as a scene from the series was shown to those who attended. Unfortunately everyone watching the live stream weren't able to see any of the clips so I haven't seen anything or read any reviews about it though I'm sure that will be circling the web soon enough. However the panel itself was very informative and there were some incredible never before seen photos revealed. My excitement for the first live action Star Wars TV show is uncontrollable and I can't wait to watch the first episode November 12th on Disney+! The President of Lucasfilm, Kathleen Kennedy, herself was wearing the new Mandalorian t-shirt available at the Celebration Store and spoke with exuberant passion over the show which takes place after the fall of the Empire and before the emergence of the First Order. She proudly introduced Jon Favreau (Creator, Writer and Executive Producer) and Dave Filoni (Director of the first episode) and before she left the stage she gave a huge nod to Dave Filoni, "I think everyone knows that this guy is a rock star! What can be more exciting than Dave Filoni directing live action?" I myself am huge fan of Dave's work and I'm anxious to see the magic he is going to bring to the first episode! Both Jon and Dave explained that they looked at everything from the original films to the prequels and from the cartoons to legends in creating The Mandalorian. To me this shows great respect and admiration for the fans. We've already seen some amazing things on Jon Favreau's Instagram page and I can't even begin to imagine what else they have in store for us! I would also like to add that Dave might be credited only for directing the first episode but he seems to be just as involved as Jon with The Mandalorian and even contributed some writing for the show. Pedro Pascal's description of the Mandalorian instantly reminded me of Saw Gerrera. He sounds intense, possibly ruthless. My hopes for this character is that he is a complete bad a**. 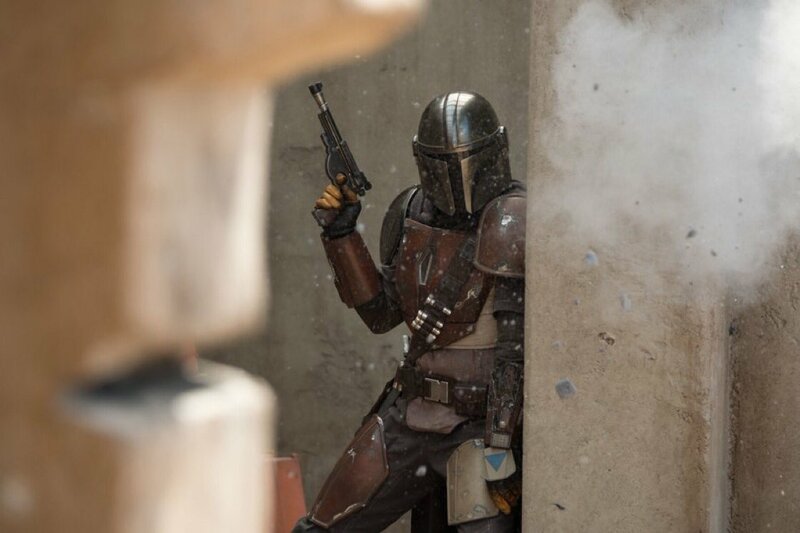 I want to see a Mandalorian like we've never seen before! I want all of our Boba Fett dreams to come true in this character. We were introduced to a new character one which I am very intrigued by. When Gina explained that her character used to be a Rebel Shock Trooper my eyes widened with excitement! You all know how I love my Troopers! Jon Favreau explained later in the panel that Gina's stunt double might not have been having the most fun because Gina did a lot of her own stunts. 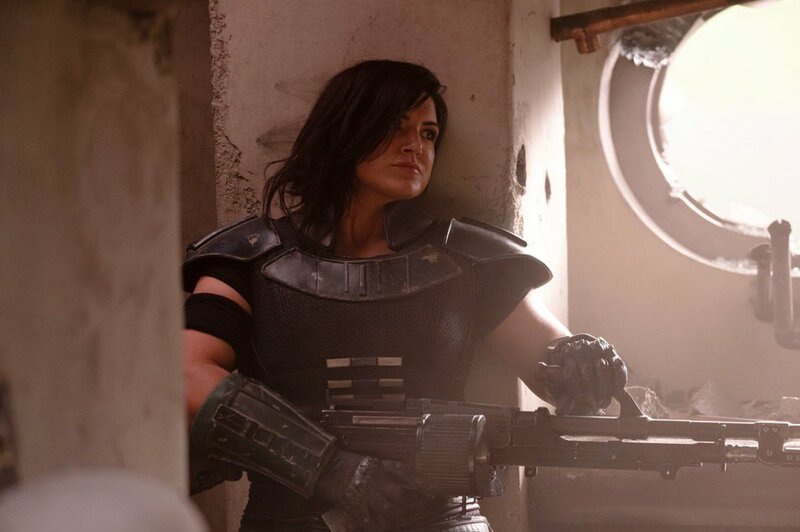 I hope this means we get to see the character of Cara Dune in a lot of action. 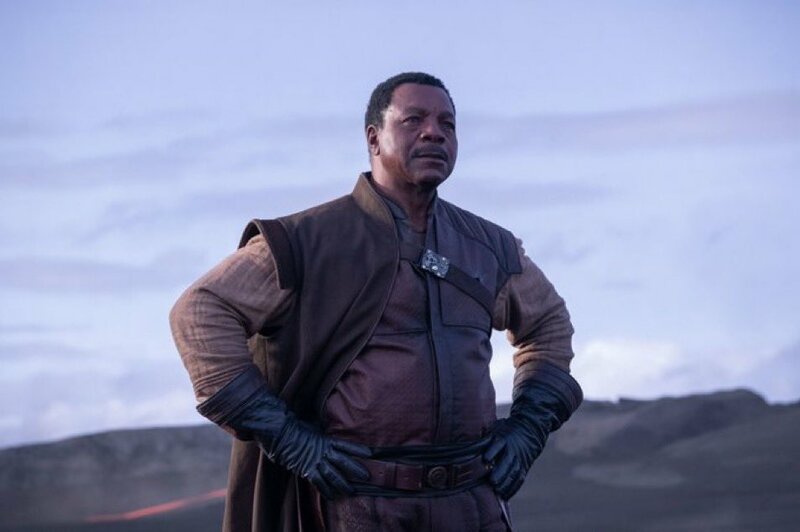 Another new character named Greef Carga played by Carl Weathers was revealed. From what was shared he seems to be an "in charge" kind of guy who the Bounty Hunters report to. 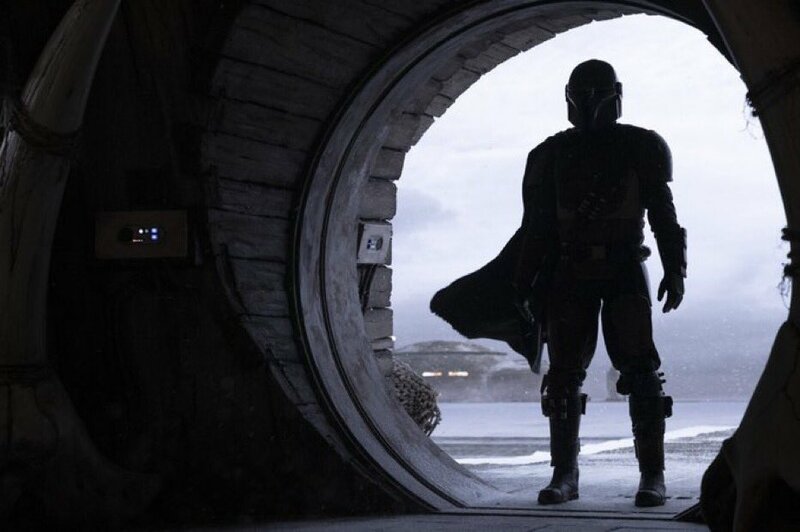 I'm really curious to see how his character's relationship will be like with the Bounty Hunters and what sort of involvement he will have with the Mandalorian. Will they end up working closely together? Both John and Dave talked about how there is a scene in the film where several Stormtroopers were needed. They called the 501st and the fans who showed up on set had absolutely no idea why they were there until they began filming. I truly love that the fans got to be involved with this project. The actors spoke very highly of their attitudes and character performances. We got an incredible look at the new ship in The Mandalorian and some video footage of how they created a miniature version of it to get some mind blowing shots for the show much like George Lucas did for the original trilogy. I really like the design and hope to see it in some epic battles! Both Dave and Jon shared stories of when George Lucas visited the set and laughed about how Dave would occasionally correct George on his knowledge of Star Wars. Jon also said that when Dave wasn't present George Lucas expressed how proud of Dave he was. I found this especially heartwarming considering how closely George and Dave worked together on The Clone Wars. 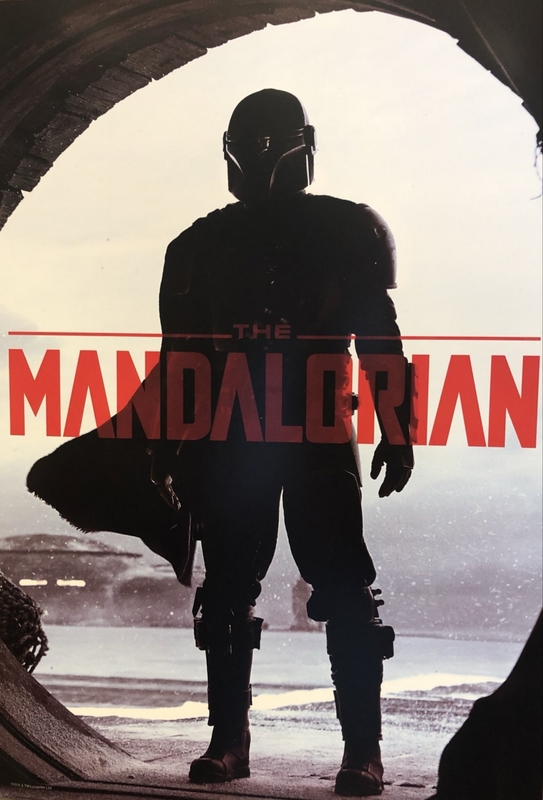 On a scale of 1 to 10, how excited are you for The Mandalorian? What information from this panel are you the most intrigued by? Let me know in a comment below! 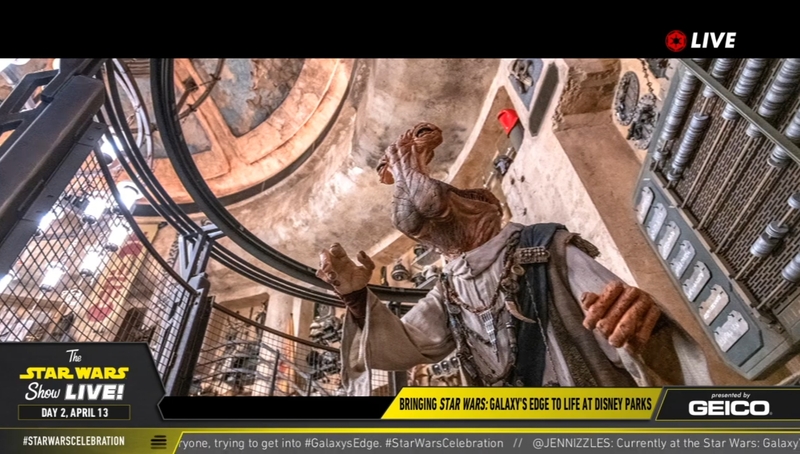 This morning at Star Wars Celebration we learned some exciting new details at the Galaxy's Edge panel. While there was no new information concerning reservations (this is required to gain access to the land during the first month of it being open at Disneyland) there were fun tidbits that I thought were worthy of highlighting and sharing with any of you who might have missed it. 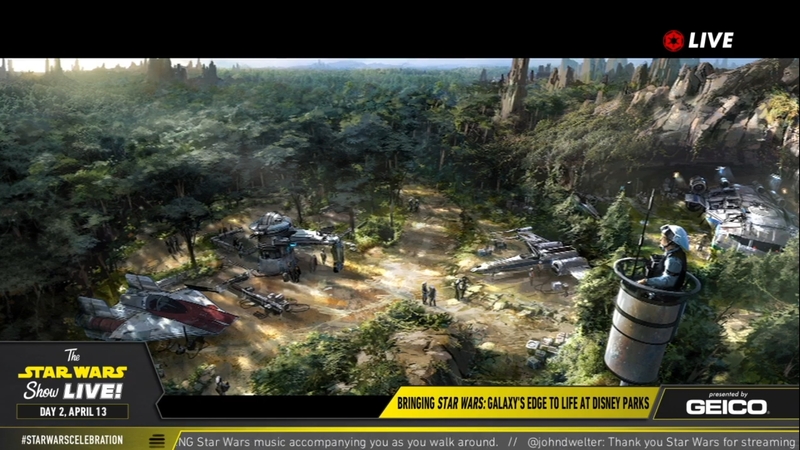 We've known that Galaxy's Edge will be the biggest land at both parks for quite some time but I don't think we'll be able to fully grasp that concept until we've found ourselves on Batuu, a planet and remote trading port that has been around since the beginning of Star Wars. 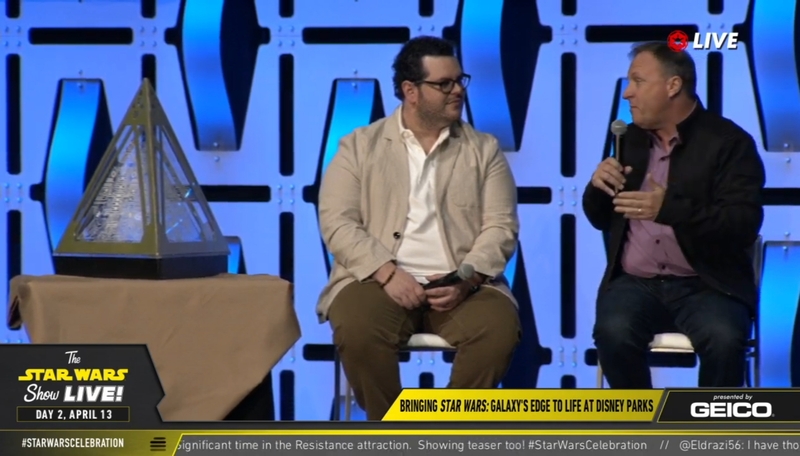 The host of the panel, Josh Gad, described Galaxy's Edge as, "The single most insane thing I have ever seen at any park." It's hard to believe that I will be on the planet Batuu in just over a month! Galaxy's Edge is not meant to feel like other lands at the parks. Everything you can interact with, look at, and purchase is meant to make you feel like you're at Black Spire Outpost on the planet Batuu. Even Mynock Jerky is a thing and it's delicious according to Chris Beatty, Executive Creative Director of Walt Disney Imagineering. Speaking of refreshments, it was announced that Coca Cola is working with Galaxy's Edge to bring us four different drinks with newly designd bottles that have logos in Aurabesh to help fit within the theme of Batuu. I think the designs are fantastic and even though I'm not a soda drinker, I'm sure there are many fans who will be collecting these. Those who attended the panel also went home with red shirts and the words Coca Cola in Aurabesh on the front with the Galaxy's Edge logo on the sleeve. Apparently they were all size XL so you might want to hit up eBay. Dok Ondar's Den of Antiquities will be a place where fans can not only build and purchase their own lightsabers and other unique items but it will also be place where you can challenge yourself to look around and find hidden gems from the movies and cartoons. I think it's encouraging to know that they have considered the different tastes of Star Wars fans. Hearing The Clone Wars mentioned definitely put a smile on my face! There will be several alcoholic and non-alcoholic drinks as well as appetizers at at Olga's Cantina but apparently the music coming from DJ R3X is what really sets this place apart. Matt Martin who is a member of the Lucasfilm Story Group explained that R3X flunked his way out of Star Tours and ended up in the final battle of Jakku in a very epic TIE chase. He crash lands on Batuu and he is rescued and repaired by friendly droids and somehow ends up becoming a DJ at the Cantina. This was basically the reader's digest version of a seventeen page fan-fiction believe it or not! DJ R3X will have a myriad of tunes to play including some inspired by Figran Dan and the Modal Nodes (you can listen to a couple of clips here). Oh, and in case you were wondering Paul Rubens returned to provide the voice for R3X! 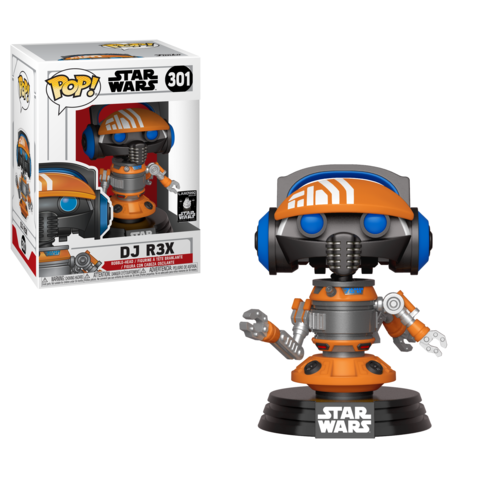 Speaking of DJ R3X he is getting his own Funko Pop which will be a Disney Parks exclusive! Normally Disney Park Funko Pops are also made available online but nothing has officially been said about this yet. One of the most exciting moments of the panel was finding out that Yoda would be part of the Galaxy's Edge experience. And yes, Frank Oz has returned to provide the voice for our beloved Jedi Master. 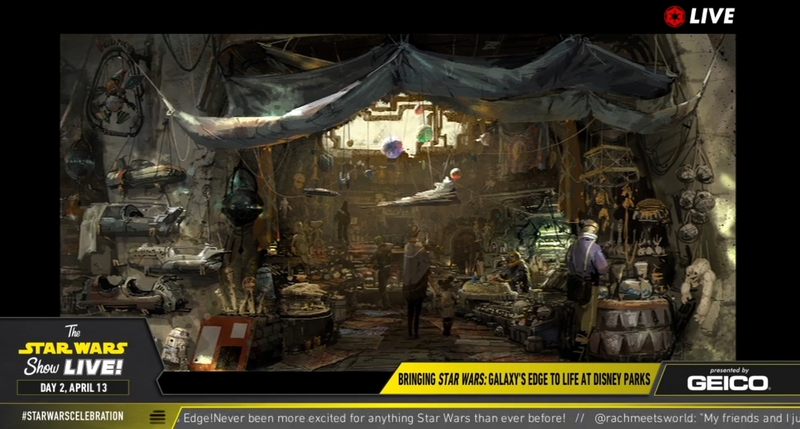 We also learned that Nien Nunb will be making an appearance at the park. The team flew to Kenya to get the recordings they wanted from the original voice actor, Bill Kipsang Rotich! 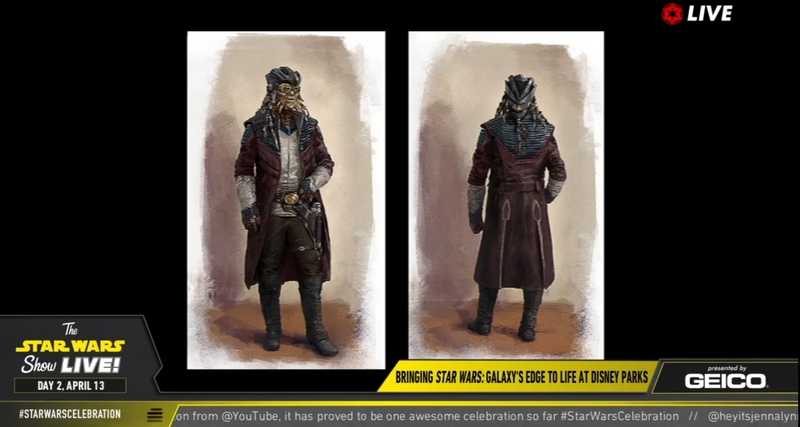 And last but not least, Jim Cummings is also back as our favorite pirate, Hondo Ohnaka. If you're at Star Wars Celebration Chicago you're going to want to find time to go to the Galaxy's Edge booth. There's a designated area where you can “Share Your Star Wars Story” which will somehow be incorporated into the land with the Holocron pictured above. What an exciting opportunity! As far as the attractions go nothing was discussed that we didn't already know. If you've been out of the loop on the recent Galaxy's Edge happenings might I suggest Entertainment Weekly's 8 Part Tour? It will blow you away! 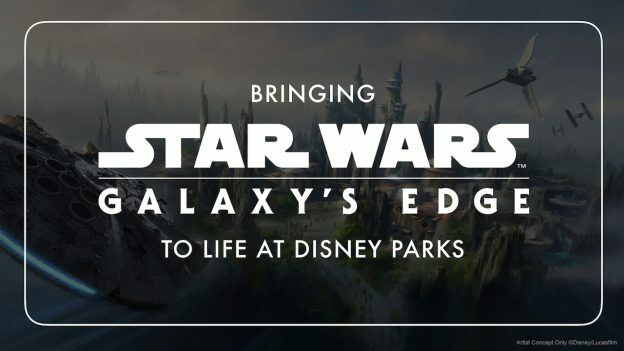 Galaxy's Edge opens on May 31st at Disneyland and on April 29th in Walt Disney World. Tell me, what information from this panel stood out to you the most? Let me know in a comment below! Hello friends! I'm Jenmarie. You've stumbled upon my Star Wars blog of eighteen years. Here you'll find style inspiration, news and tips on my favorite collectibles, articles from a certain point of view, and everything else that's 100% geeky. Enjoy your stay! Copyright © AAHA 2018. Powered by Blogger. AAHA is licensed under a Creative Commons Attribution-NonCommercial-NoDerivs 3.0 Unported License.